Career Wear: Will People Take You Seriously in a Skirt? It’s fun to watch styles filter down from prêt a porter collections to mainstream fashion. Remember how denim shirts started surfacing as fringe fashion 6 months ago? Well, true to the resurgence of 90’s fashion, edgy denim shirts are popping up everywhere in all sorts of styles, weights, washes and price points. Sister to the denim shirt is the preppier, blue chambray shirt and that’s making a big comeback too. This might not strike a chord with you immediately, but I’m making the denim shirt a “must have” for Spring. It’s versatile once you’ve got your head around how to wear the item both casually and with more dressy pieces. 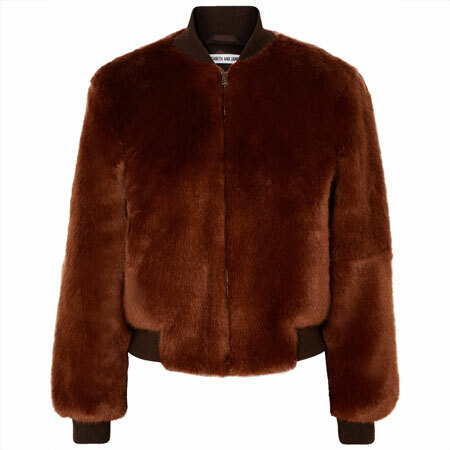 It also double duties as a great layering piece for Autumn. It starts with selecting the right style for you. For some this means a regular shirt, and for others it means a tunic or empire cut style. It took me ages to find the right denim shirt because I was fussy about the details. It had to be soft and lightweight like a shirt and not feel heavy like a jacket. It also had to be in the right wash and fit just so. I didn’t fancy the more clean-cut chambray shirting styles either, feeling that they’re too preppy for my fashion persona – but again, this might be a nice option for you. I eventually found the perfect denim shirt at the Gap (top left in the pictures above). It happens to be very similar to a Levi’s denim shirt that I wore to death in the early 90’s. I fell in love with my new shirt’s pearlized snap-buttons which, of course, are a great match with my unending assortment of pearl necklaces. With black bottoms or micro check pants: Matching a denim shirt with a casual bottom in a different colour or fabrication is a no-brainer. Black jeans, Ponte knit pants or woven cigarette pants are the easiest options. 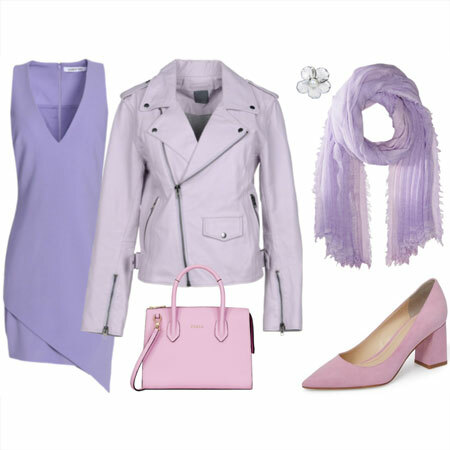 Create outfit interest with items like a belt, lacy camisole, scarves and a jacket. Julie showed us how to wear this look with sass and style a few months ago. With white denim bottoms: For an effective fresh edge, substitute black bottoms for white jeans or a white denim skirt. 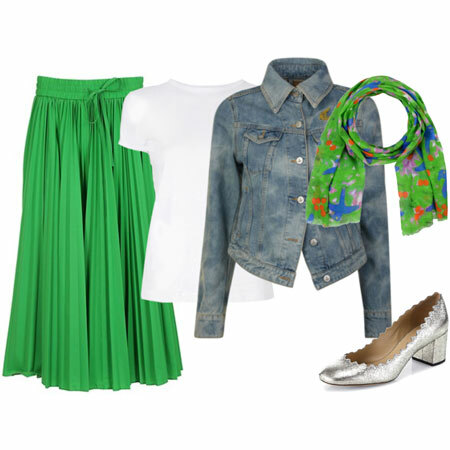 With a dressy skirt: Adding a dressy spin to a denim shirt is my favourite way of wearing the item. The J Crew outfit (bottom left above) is a fabulous example of this concept. Over leggings: You’ll need a denim tunic like the Esprit style above for this look. Add boots or ballet flats and you’re set. So easy for gals on the go. For years it’s been a fashion faux pas to wear denim on top of denim (for example, a blue denim shirt with jeans in a similar wash). Believe it or not, it’s this very faux pas that’s become all the trendy rage. (I love it when fashion reinvents itself to make old faux pas stylishly acceptable). I believe that denim on denim can work when the rest of the outfit variables are right. You’ll need to pick your denim items carefully and add in a good amount of additional textural interest to the outfit – a topic for another day. I’ll be sporting both mainstream and more daring denim shirt looks over the next few weeks so stay tuned for examples. Love the new denim shirts. I want a tunic or a boyfriend cut. They are so soft but more polished looking (I think) then most knitted tops. Thanks for the “must have” status, Angie. I know what’s on top of my list. Hmm- I am going crazy for 90’s, aren’t I? First my sharp-shouldered jacket, then my docs, now this! Interesting. I can’t quite picture a denim shirt on myself YET… but I’m very open to the idea. Impeccable timing, as always, Angie. I thrifted a denim shirt just yesterday! I am still feeling obstinate. I REALLY dislike the look of these. No matter how they are styled, part of my wants to wipe my imaginary greasy mechanic’s hands all over them. The new denim shirts are much more fitted than I wore in the early-to-mid-90s. I loved my shirt then, and am sure I would love a new one worn in the ways you’ve described. So cute. I love the one in the top right picture and have been admiring the J. Crew look ever since it came online. Very much looking forward to your pictures and how you’ll be wearing yours Angie! I love mine! I have one similar to the middle one on the second row. I do like the Gap one, too Angie. I’ve worn mine with black pencil skirts so far, but I plan on pulling it out more in the spring. I love it. I have to admit I have been surprised by the versatility of my denim tunic, I don’t believe I have worn it in the same way twice and my wardrobe is very limited. I’m very much looking forward to your looks Angie, I’m in no doubt that I will be inspired. Not my cup of tea, but can’t wait to see Angie modeling the look. Sabrina and Sarah, high five! Ele and Maya, you crack me up. Denim shirting has come a long way since the 90’s. The fabric is more supple and feels quite lovely against the skin. Also, there are many more washes to choose from. I’m all for the good parts of 90’s fashion as long as the looks are improved and the incarnations are fresh. Palm Fronds, I can totally see you in a preppy chambray shirt with white jeans. Julie, that’s what I like to hear. Item versatility! I hope that my outfits inspire you as much yours inspire me. Laura, you’ll change your mind. I’ll bet on it. I was thinking of heavy weight denim in a dark wash, and I was not interested at all. However seeing these lighter, prettier denim shirts, and hearing that they are softer than their distant relatives makes them more appealing to me. I had also decided that I just was not going to wear white pants of any kind. Now I want to wear a soft, pretty blue, denim shirt with white jeans. Sounds good for spring and summer in the PNW, doesn’t it? I like denim tops and look forward to your looks Angie. I notice the Gap models have denim on denim on denim today on the homepage. I have the BR one – top middle. I’ve worn it twice. The first time I wore it plain and simple, with black ponte knit slacks, and I couldn’t shake the feeling I was under-dressed and retreading a look I lived in during the 90s when I was a stay-at-home mom. The second time I added a black velvet ruffled jacket and popped the collar. That felt right. I am under the weather today but have to run errands later so I think I will drag it out again and wear it the plain and simple way. It is a cozy and brain-dead outfit. I love the idea of white jeans with it. This is a look I want to play with and can’t wait to see your outfits, Angie. I want a shirt that is soft with some stretch, not too pastel and not messy looking or western. The top far right might work, and the Esprit tunic looks great. I have a denim shirt that I bought and used in early fall as a layer with it was too warm for a jean jacket. The idea of pairing a shirt like these with black or with white denim is appealing. I’m torn about this one. I’ve looked at denim shirts and chambray shirts a few times over the last few months, but so far haven’t taken the bait. I worry about having a similiar experience to my plaid shirt experiment this winter. I bought one in a nice fuchsia plaid, thinking I would funk it up and wear it with pencil skirts etc. It never really worked for me. I think a denim shirt is equally hard to pull off for a funky urbanite look. I have no doubt that it can be done – and I totally look forward to seeing you model it for us, Angie!! – but I’m not super confident that I’ll make it work for me. Not giving up hope yet, though. I do find the soft colors of denim shirts very flattering. I don’t think denim shirts are for me, but I can totally see myself wearing a chambray shirt with my white denim skirt this spring/summer. I’m more of a preppy girl, I think. I bought a denim shirt on sale at Kohls a while back and have only worn it once. I put it on with black pants, but it just felt blah…what Shiny said. I think I’ll wear it much more in Spring with skirts, etc. I can’t wait to wear it with my white bermuda shorts and my new Clarks raspberry wedges! A coral necklace would look wonderful against the denim if I could find the right one! I really, really, really, really love this look. There is a shirt at H&M with puffed sleeves that I am in love with and I did try on a chambray shirt today at Zara, which didn’t fit. 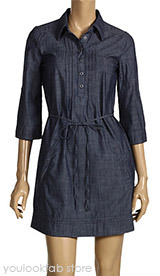 How can I fit a Medium dress, but barely slip into a Large in a shirt? The J Crew look is amazing and I think that this would be how I would like to wear it. I love the tunic dress, I wonder if Esprit in the UK carry it? I have been looking for just the right one. I almost bought one the other day, but it wasn’t long enough to really be a tunic, and not short enough to be a regular shirt. I’m going to try to make it to Old Navy to try on their version, because it was really lightweight. You’ve inspired me to wear my denim shirt today! 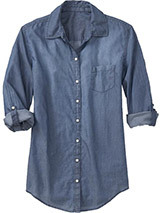 I’ve got a denim shirt and a chambray tunic and they are so comfy. Sandy and Boof, a soft pretty blue shirt with white bottoms is such a great look for both of you. 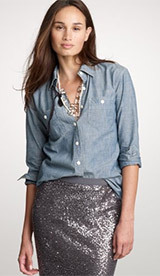 Shiny, you need to dress up your denim shirt for it to feel right for your style. Antje, a denim shirt is SO urban and funky in my book. I am sure that you will make one work for your style. I think my husband has some of these shirts. I only wish that someone would come out with a version sans chest pockets! D’oh! I am all over this though I do have to laugh because mid-nineties when I graduated highschool I had one of these and was so ready to get rid of it! But it was much stiffer than the ones that are out now. 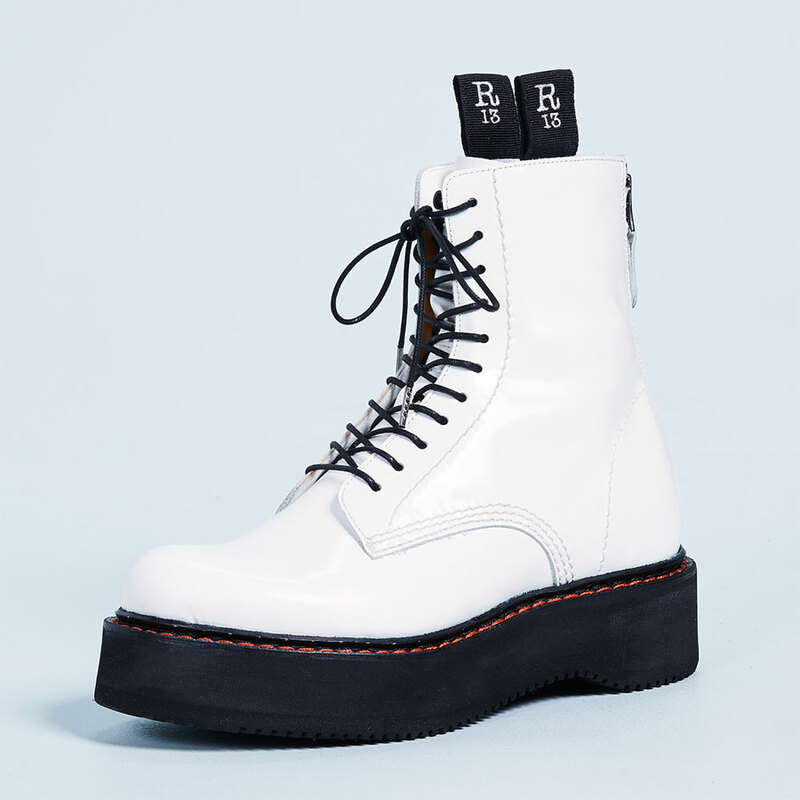 I’m eyeballing either the Gap one or the Old Navy one (not pictured, but I’ve noticed it online) For those of you that have these – are you buying your normal size? I like the idea of an updated classic. My problem with chambray is always the color. I need to find just the right shade. Traditional chambray never works for me – I’m not sure exactly. I look good in French blue, and I love some pale denim, so I’m willing to give this a try if I can find the right one! 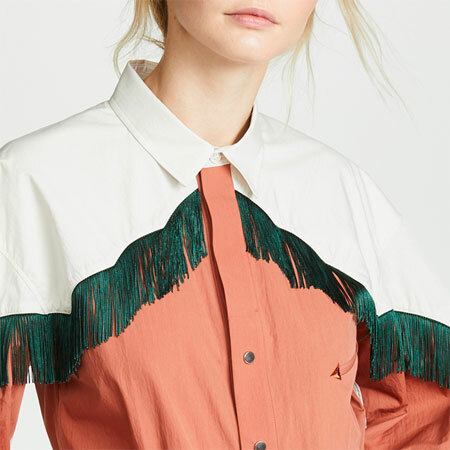 Would the Frye Carson boots be too much “cowboy” with this shirt? I LOVE mine with a black pencil skirt or VERY dark denim skirt”) I do think these need to really be dressed up to look right. There is definitely something to be said for the softer shades of denim blue. I eventually found those prettier against my skin tone than the darker shades. Agrace, I’ve found all the denim shirts that I’ve tried on fit true to size. But I was not after a voluminous boyfriend look with this item. I went for structure. Tara, I think you’d be fine wearing a denim shirt with cowboy boots, WITH something unexpected added into the ensemble mix. What will you wear on the bottom? Taylor, you and I are on the same denim shirt page. Like Maya, I can’t get excited about this look, sorry! It might be my late fashion adopter self, and I might still turn around, as it happened before. I do appreciate the styling tips and I’ll be looking forward to the outfits you create with it. I love this look! I’m not sure just how to mix a denim shirt into my current closet though…as a matter of fact I bought a Target denim shirt (Converse One Star) a month or so ago and haven’t worn it yet. This post made me realize something else, too. I have no idea of the difference between denim and chambray! I’m another one who can’t see this look on herself. Denim shirts have frumpy connotations in my mind, and even updated ones worn well don’t seem to be very interesting to look at. It’s not that a stylish and attractive woman couldn’t pull off a denim shirt, but even this hypothetical woman would probably look better in something less workaday. Besides, I’m not fond of washed-out blues worn near the face because my coloring is vivid and requires shades with a bit more drama. I guess I’m just surly. I want designers to deliver fashions that are inherently beautiful rather than these rather blah things that the consumer has to work to make interesting and flattering. The only shirt I’m attracted to in this bunch is the darker denim one with dress styling. The rest make me think of mechanics and gardeners. I know this makes me really out of step, but I’m a little despondent wondering why this is a trend. I’d love to see designers pushing something a little less banal for once, and I’m quite tired of seeing the trends of my youth coming back while I’m still young. Sorry for the mini-rant. In my closet, I have one really old (15 years?) Ann Taylor chambray button down and two company-logo denim button downs. I wear them while slobbing around the house, and I thought that was where denim shirts would belong. However, the more I read about this look, the more I am willing to give it a shot. I really like the Gap one and have ordered it. Will post pics and review. Looking forward to “funkifying” it! Oh my goodness! I will have to get one of those cute denim shirts! This does remind me, however, of the day that we sorted of the denim shirts out of Nik’s closet that had some sort of MSFT product embroidered on them. I think we had a pile of almost 30 different shirts with everything from SQL server to Windows NT emblazoned on them. He kept two and gave the rest away. So funny you would mention the pairing of denim with denim and that it’s okay now. Just today a very stylish friend of mine was rocking the Canadian Tuxedo. Love the denim shirts you’ve found and the way you’ve styled yours. Thanks for a great string of posts! So I didn’t comment on this post initially because a) I was very busy and b) not very enthusiastic about the denim shirt idea. Even reading this post alone wasn’t enough to convince me. But thanks to your follow-up posts, and the fine example of others on the forum (Laura & Louise I’m looking at you!) I’m officially a convert. Yay for ylf opening minds – thanks Angie!! Just had to add a comment on the Gap shirt. It FEELS amazing on. Although the XL pulled across the bust it still looked incredible on and I will definitely be ordering the right size! I can’t wait to wear it – thanks Angie for showing us so many options. OK, I’m ready to get a denim shirt. Denim shirts are so versatile. I love to sew, when my father-in-law (yes–father-in-law) gave me a huge denim shirt made of the most gorgeous perfect denim, I cut it apart at the seams and made myself a tailored button down. I am thrilled to find that denim shirts finding their place.